If I had one word to describe Nasreen Bhutta, CEO of Project Starfish America, it would be fiery. Nasreen is one of those rare gems who is truly passionate about people. She is an open, intelligent, tenacious, energetic agent of change who also has Retinitis pigmentosa. Retinitis pigmentosa, also known as RP, refers to a group of inherited diseases causing retinal degeneration. The first time I met Nasreen was several months ago on a conference call with several attendees. Since the call was our first meeting, each attendee was asked to introduce themselves to the group. Like a true introvert even though I know it’s coming I always choke during these initial sessions. So instead of paying attention, I was rehearsing a silent dialogue of what I’d say. I felt I did alright until the last person spoke. By now you’ve probably guessed the last person at bat was Nasreen. She not only introduced herself, she went around the virtual room making a comment on something each of us said. This may not seem like a big deal but it spoke volumes because it showed she was carefully listening to each of us. When Nasreen spoke about her involvement with Project Starfish America I knew this woman was fully invested in the program. In a nutshell, the organization works to help people with disabilities to launch or re-launch their careers. Nasreen, who speaks passionately about the project, is committed to making a positive change in the lives of these individuals. Mahatma Gandhi once said, “Be the change that you wish to see in the world.” Nasreen is a living example of what this quote means. 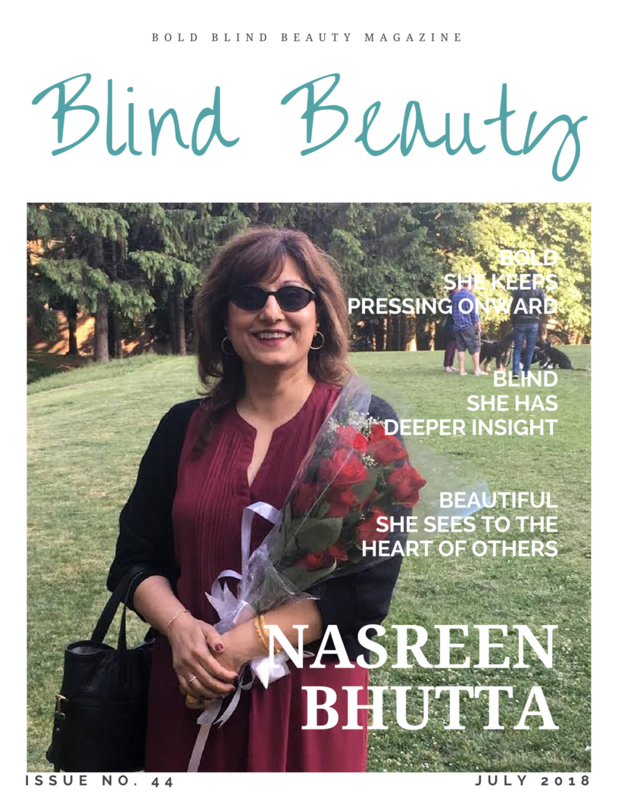 The featured image is a faux fashion magazine cover titled Blind Beauty. Pretty brunette and sunglass-clad Nasreen, is standing outside wearing a burgundy dress with a black sweater. In celebration of her daughter’s graduation, she is smiling broadly while holding a bouquet of red roses. Amazing! Love the Project Starfish! And I’m ready to re-launch my career!